Why Should you Become an Online Influencer? Recently, LinkedIn announced that they were to open applications for people to become ‘influencers’ or ‘thought leaders’ on the professional networking site, but why would you want to? Influencers are people who are considered to be at the top of their game when it comes to their industry and their opinions on it. This helps them to reach the right people in their industry and boosts trust and reputation. LinkedIn has thus far only opened its doors to becoming an influencer on their site to 150 people, with more expected in the coming months. However, a quick look at the thought leaders on the site shows people like Richard Branson, so I think it’s wise to say that it’s not a simple task to become one, although if you want to you can apply here. In order to become a thought leader, it’s something that you are going to have to invest time in though and in order for LinkedIn to accept you, you’re going to have to push some very good, well-written and innovative content their way. Why become a thought leader and is this the only way? Of course not, many online influencers began with their own blogs, providing insight and ideas that others in the industry didn’t. This is no easy feat of course, you do have to consistently write authoritative blogs which can take a while to get noticed. To become a thought leader for LinkedIn, you have to prove that you are an authority on a subject and give links to prove it (although I suspect Richard Branson didn’t). Another stipulation is that under no circumstances should you market or push your own products on the social site. You should be talking about your industry, it should be insightful, thought-provoking and inspire trust in other professionals that you have a real grip on the subject matter. This will of course push more business your way, whilst ensuring you’re reaching your industry peers. As we all know, social marketing works, especially as a form of ‘word of mouth’ advertising and what better way to gain a wide audience than on LinkedIn? 92% of people are swayed by family and friends, rather than something that they have read online, which accounts for 59%. The real influencers are those that talk about products, services, research, the things they have read online and made it into something creative. LinkedIn can help you reach an audience of 175m+, which let’s face it, is going to help business-wise. How successful you can be by applying is another story, but it’s worth keeping an eye on just in case you can slip in there – worth applying anyway. 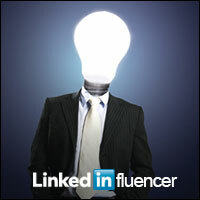 Whatever the case, influencers can usually take years of hard work to build a decent reputation and become a thought leader; LinkedIn at this point is offering something of a short-cut to this, so it’s worth giving some thought to, especially when you consider how it can build your business substantially. Not getting the most out of social media? Hire us for social media monitoring.